Cottonwood Cove Marina boat rentals and jet ski services. 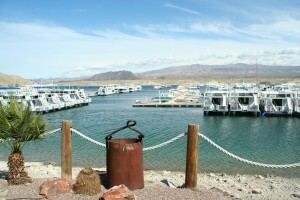 This resort is a very nice family oriented resort at Lake Mohave National Recreation Area. Cottonwood Cove is far removed from big casinos and hotels; this resort is perfect for those who like a more quite and relaxing boating vacation on Lake Mohave. Cottonwood Cove Marina will have all the necessities one will need on their boating vacation which include store, houseboat rentals, motel, water skiing lessons, wakeboarding, kneeboarding, wakesurfing instruction, beach area, jet ski rentals, waverunners, ski boats, wakeboard lessons, dock, boat launch ramp, lake tours, and more. Arizona Boat Rentals offers all their watercraft rentals and chartered services for those customer who want the best in high end rentals while vacationing at Cottonwood Cove Marina.